Step by step instructions for applying for an official Veterans Affairs Veterans identification card (VIC). There are two ways to apply through Vets.gov and AccessVA. Instructions for both are detailed below. Make sure you have a copy of a state or federal issued ID and a photo saved (size limit 3MB) on the device you will be using. 1. Visit https://www.vets.gov/veteran-id-card and sign into your Vets.gov account. 2. Sign in with an existing account by selecting “Sign in with DS Logon” or “Sign in with ID.me”. If you don’t have an existing account, you can create a DS logon account by clicking here. You will be required to verify your identity if you have a basic or advanced DS Logon account. Please proceed to Part II to verify your identity. 3. After you are logged into your account click “Request a Veteran ID Card” and proceed to Part III to complete your VIC request. 1. If you used your DS Logon account to sign into Vets.gov and you have a basic or advanced (non-premium) account, you’ll need to verify your identity through ID.me to finish setting up your account. 2. 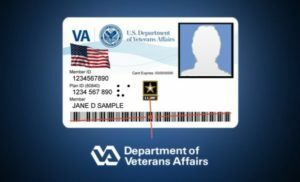 If you used ID.me to sign into your Vets.gov account and the “Apply for VA ID Card” link is “grayed out” you must click “Verify your Identity” to finish setting up your account. 3. After your identity is verified you will be directed to the VIC site. 1. Validate your personal information, upload a copy of your federal or state issued identification, and a personal photo that will appear on the card. You cannot edit your Character of Discharge. If there is a need to update your Character of Discharge, upload a copy of your DD-214 to the application. 2. Once you have confirmed that your information is accurate and uploaded all required documents, click “Preview Card”, and then click “Submit Request”. If your request is approved, you can expect to receive your VIC in the mail within 14 business days. The envelope will contain 2 printed Veteran ID cards. Are You Having Issues Submitting a VIC Request? If you received a message that your records could not be found, or your eligibility could not be determined, and believe you are eligible for the VIC. Send an email to vic@va.gov and let the VA know what went wrong so they can investigate the problem. Veterans who apply for a card should receive it within 60 days and can check delivery status of their cards at vets.gov. A digital version of the VIC will be available at a later date. Make sure you have a valid copy of your state or federal issued ID, an image to appear on your card, and a copy of your DD-214 or other official military discharge document that reflects an Honorable or General character of discharge. Follow the instructions below to submit your VIC requests using Access VA.
Sign into your account using AccessVA. Select Sign in with DS Logon to access the VIC Application. To use DS Logon credentials to access VIC, a Level of Assurance 2 (LOA2) is required. Once you have successfully logged in, you can proceed with your VIC request. Having issues? Send an email to vic@va.gov. The VIC is different from a Veteran Health Identification card or a DoD Uniformed Services or retiree ID card. As such, the VA identification cards cannot be used as proof of eligibility to any federal benefits and does not grant access to military installations.